That would be the usually-frozen-by-now-but-not-this-year Inca lake at Portillo ski resort, Chile. It seems I can’t open up any social media feed right now without seeing a photo posted from friends travelling in South America or New Zealand. Fair enough—after all, it is the season for summer skiing. Bastards. I add that proviso as I sit in bone-dry Whistler sweltering in 37˚C heat knowing that even ski-touring on glaciers is out of the question at this point in our strangely searing summer. I also say it because I dearly miss Chile. Back in the early 1980s I’d decided to ski-bum there on a coin-toss after my undergraduate degree, living in the mountain town of Farellones and skiing the neighbouring areas of El Colorado and La Parva. I wasn’t the only northern hemisphere ski aficionado there—a handful of other Canadians, Americans, Swiss, and French were also living what, in retrospect, now seems an outlaw existence. The high-alpine of the Andes was beyond all of our wildest expectations, and frequent closures for huge storms in that El Nino season meant we often had it all to ourselves. Out of bounds? There wasn’t any. We went where we wanted (followed by a squadron of hopeful Andean condors). The bottomless powder we ski-toured to during the sunshine between storms eventually, in the ’90s, became the world-class destination ski area of Valle Nevado. Other adventures we undertook that season now comprise the cat-ski tenure of Ski Arpa. Things in my old stomping grounds have changed considerably. Like a summer romance, however, Chile never left me. Though much of the wildness of those days is gone, the important things remain: the vastness of the Andes, their wide-open slopes and cobalt skies. Which is exactly what I found when I returned a few years ago to visit the one resort I hadn’t managed to when I lived there: Portillo. High on the Chilean-Argentine border several hours north of the capital of Santiago, Portillo (“gap”) is one of the alpine world’s great destinations and a must-see for any true skier. The resort’s mainstay is the activity-filled, cruise-ship-in-the-sky Hotel Portillo. Channeling unassailable timelessness, its storied hallways are hung with photos, mementos, and framed accolades from the many national ski teams and Olympic medalists who train here during the June-September South American winter. Surrounded by this gallery of friends and ski legends (many one in the same), longtime owner Henry Purcell and family occupy their same table at dinner every night, creating a distinct sense of history unfolding. The cavernous dining room is paneled in leather, the staircase handrails wrapped in it—so thick and well-tanned it seems like polished wood. A swarm of red-coated waiters and busboys in starched whites deliver food Euro-style in record times. Soaring rock faces and alabaster peaks pour in through floor-to-ceiling windows to accompany your meal, the drama exacerbated by weather—whether snow, sun, or wind. Even in the dry years that are becoming increasingly frequent because of climate change, untracked snow can always be found there with a little hiking and reading of the wind. Especially on the infamous Lake Runs—accessed from one of Portillo’s notorious, high-speed, “slingshot” platter lifts (something only a racer can appreciate)—where you will find magnificent chutes with 650 vertical metres of 30-degree amazingness. 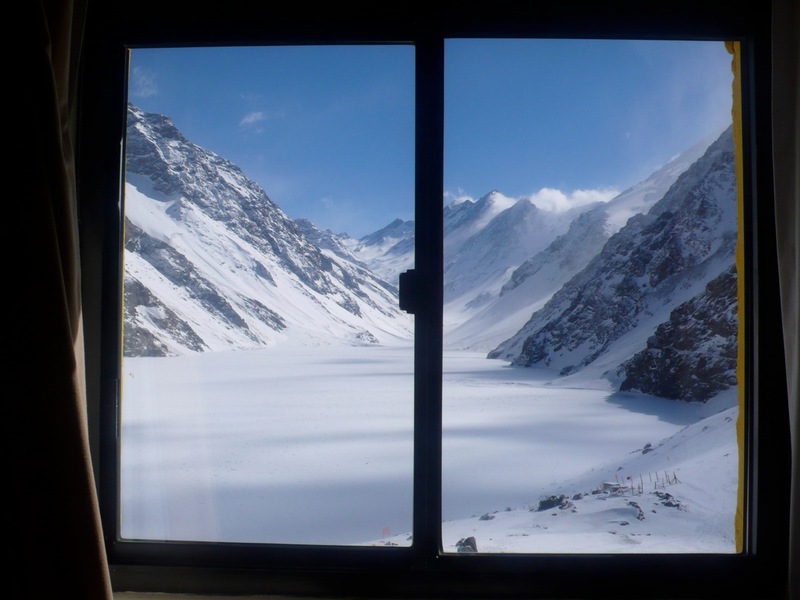 Each winter (our summer) the hotel is chockfull of tourists and teams from around the globe: skiing, training, and lounging; eating, drinking, and making merry; partying until dawn with Escudo beer and the local specialty, pisco sours, in smoke-filled bars like La Posada. And though skimpy snowfalls and unfrozen lakes seem more often these days to dominate my friends’ postings from Portillo, it would be truly sad if its legendary terrain were permanently affected by climate change for more reasons than those of a selfish skier. Henry Purcell, for instance, notoriously pursues an eco-friendly operation: he doesn’t like snowmobiles, so there are none; the area is serviced on foot and lift by piste workers and patrollers, a craggy lot whose faces seem chiseled from the surrounding rock. These are things you can’t glean from any social media feed, no matter how tempting the pictures. You just have to go, as I once did, on a whim.